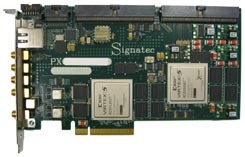 The FPGA processing model versions of the PX14400D feature an onboard secondary Xilinx Virtex-5 SX50T or SX95T FPGA with its own 512 MB RAM bank for dedicated embedded signal processing. Programmable Decimation and Down Conversion (DDC) – This is the default enabled processing feature on PX14400D FPGA processing models. It provides decimation processing for single channel mode only with decimation factors of 16, 32, 64, 128, 256, 512, 1024, 2048, 4096, and 8192 for a specified NCO frequency. Any of these provided FPGA processing routines can be loaded onto the PX14400D with the PX14400 Scope App, which also detects the current loaded processing feature and displays the related interface for making settings that apply to the routine. The processing FPGA is fully end user programmable, allowing for customized embedded processing routines to be developed and utilized with the PX14400D. Signatec provides custom FPGA design services to meet specific application requirements for customers who don't want to program the FPGA themselves. Contact Signatec to discuss specific project requirements, feasibility, and scope for customized solutions. PX14400D-SP50 = Virtex-5 SX50T: 52,224 logic cells / 4,752 kbits block RAM / 288 DSP slices. PX14400D-SP95 = Virtex-5 SX95T: 94,208 logic cells / 8,784 kbits block RAM / 640 DSP slices. The custom programmable FPGA logic needs to manage two data interfaces: the acquisition data interface and the user register interface. The acquisition data interface provides data from the PX14400D acquisition circuits to be processed by the user logic in the programmable FPGA. The register interface provides a way for user defined custom parameters to be dynamically set by the host PC system application. Developed custom user logic firmware is packaged and uploaded to the PX14400D through its PCIe interface to the host PC utilizing the PX14400 Scope App. Alternatively the custom user logic firmware can also be directly loaded through the PX14400D JTAG header utilizing a Xilinx JTAG programmer sold directly by Xilinx. The PX14400D is a dual channel DC-coupled waveform capture board that can acquire up to 400 MS/s on each channel with 14-bit resolution. (For AC-coupled requirements, refer to PX14400A product model.) The PX14400D analog front end has a signal frequency capture range of DC to 200 MHz with 3-pole Bessel filters on each input channel. The PX14400D has two software selectable input voltage ranges of 400mV and 1.2V peak-to-peak. Optional inline SMA attenuators are available for changing these levels if needed; for example, the use of 6 dB attenuators effectively change the input levels to 800mV and 2.4V peak-to-peak. Alternatively, please refer to the separate PX14400D2 product model that provides six software selectable input ranges of 200mV, 333mV, 600mV, 1V, 1.6V, and 3V with various bandwidth specifications at each of these input ranges. The PX14400D has a primary sample-data RAM bank of 512 MB memory for onboard sample data storage. Alternatively, PCIe Buffered Acquisition mode utilizes the onboard RAM as a FIFO to provide non-stop continuous acquisition and streaming of sample data to the host PC via the PCIe interface. With PCIe Buffered Acquisition mode, the PX14400D can sustain up to a maximum 1.4 GB/s data streaming rate over its PCIe Gen1 x8 interface to the host PC for real-time high-speed processing and/or data recordings. Up to five PX14400D digitizers can be setup for synchronous acquisition operations for a total of 10 input channels by utilizing the separate Signatec SYNC1500 clock/trigger driver source card.